GeoConnections Inc. put on a brand new digital face over the weekend. 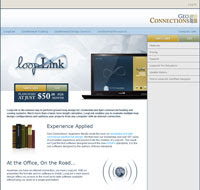 In addition to a large set of improvements rolled out for LoopLink, we upgraded our company website to something totally different. Our first website (GeoConnections classic as we call it) served us well for its life but as we have grown we have found that we and our customers were bumping into some limitations. The biggest addition we have made to the site is our new Geo Bookstore. The Geo Bookstore is a growing collection of texts for sale and for free download that we think are worth your time to read. We have a bias on some of them because we are the authors (the IGSHPA Residential Light Commercial Manual for example) but we really do think that these texts contain useful and important information that anyone involved in the design and installation of geothermal heating and cooling systems should take the time to read. We also expanded our Geothermal Resources section with more pages that you can use to help your customer's understand geothermal and how heat pumps work. We made some pretty exciting changes to the LoopLink Certified Designers section of the site as well. It is easier than ever for homeowners and building owners to find qualified designers in their area. For the certified designers, we have made managing your profile faster and easier so if you have earned your LoopLink certified credentials... update your profile to guarantee we are sending business your way. We aren't done yet so keep checking back. We are working on some new informational videos and have plans for a customer feedback center that we hope will keep us in touch with you. If you have the time... we'd love to hear what you think about the new site. There is a quick poll on the right side of this blog.